As I've recently purchased a new large LCD TV-set which also has abilities to receive DVB without additional devices I found myself in the need of also having to get a DVB-T antenna. I did a short test-drive with a borrowed antenna from my parents but was not too satisfied. There was a proper signal quality but it was far from what I expected. I'm living in direct line-of-sight from the DVB-T broadcast antenna, which is only a few kilometers away, so I should have an outstanding signal quality. But it was just a bit below average. Stable enough for uninterrupted TV viewing but nevertheless I somehow didn't want to buy an expensive antenna to just reach average signal quality. So I began researching a bit why there was such a bad receiving performance despite the more-than-ideal conditions. As it turned out, DVB-T antennas which are available in the shops have (of course) been designed to have receiving abilities across the whole DVB-T broadcasting bands (UHF and VHF). But since in each area there are only a few channels used these allround-antennas are not the ideal solution for everyone. I found several guides how to build a specialized antenna fitting for the used channels in the area but since I'm living in the direct proximity of the broadcaster I did a fast try with a simple setup. 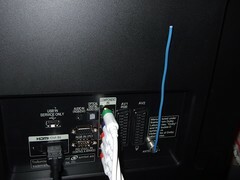 Just cut off a piece of thick wire from some I had lying around (according to the measurements I found here) and stuck it directly into the antenna-plug of my TV set. And surprisingly I immediately received the targetted channels with even better performance than with the allround-antenna. I still want to build a proper antenna with correct shielding but for now this works excellently. And I'm also planning to try making a better performing antenna (a "Doppelquad-Antenne") to improve the reception in border areas. If I find the time to build it, I'll let you know.